This paper in particular mostly looks at the groundwork that moves towards finding a voice for woman, working through Luce Irigaray and Catherine Malabou, both of whom have an investment in materiality as transformative. Both are interested in the question of whether it is possible to philosophise as a woman, or as a female subject; if so, how? And if not, how to tackle this? So the issue at stake is the very boundaries of philosophy and how to transform them – in this case, the focus is women, which may seem narrow and opens to the usual criticisms levied in such arguments around feminism, regarding race, class, and so on, but I’ll just state now that in my view Irigaray does suggest the feminine as more of a starting point for thinking difference due to its prominence in organising society and discourse alike. In a way, it’s the fact that the masculine/feminine binary is already foregrounded in discourse and aligned – explicitly and implicitly – with other dichotomies like subject/object, with the feminine always identified with the negative half of the distinction, that renders the feminine the constitutive excluded other, and a ground for beginning transformative action, which may have implications for other types of subjectivities. Sexual difference for Irigaray is aligned with Heidegger’s ontological difference; as something of a paradigm par excellence of difference, differentiated. Now, obviously the question of the possibility of a role for women as philosophising subjects is an ontological problem, but this move of alignment represents a further step, whereby sexual difference moves to being aligned with the conditions for ontology in the first place. This is the crucial step that I focus on here, though obviously diagnosing this problem as recurrent throughout the Western philosophical tradition is not a particularly useful move in terms of the question of how to philosophise as a woman. However, once we have identified this as a starting point – basically the nexus of this entire problem – we are in a position to move forward and look at means of altering this transcendental condition for the existence of philosophical subjects. In Irigaray we can find a number of approaches to reading and performing philosophy; in the past I have focused on the value of her mimetic writing; other tropes include an emphasis on metonymy over metaphor; the notion of non-representational logic, and the figure of the sensible transcendental. All of these techniques and approaches are linked by their desire to eschew fixity and to transform the meanings of the texts she is reading as well as those she is writing – this is a subversion of phallogocentrism. However, readings of her fluidity can sometimes err on the side of reading it in a negative manner, as though the desire to avoid applying fixed notions implies some wishy-washy approach that never pins anything down – thus repeating one of the fatal movements in the historical tradition of philosophy whereby “woman” is resigned to the role of the other; once again negatively defined. My first suggestion, then, is to take fluidity – as well as the other related tropes I mentioned – seriously as a positive concept, whereby the “evasion” it entails is a deliberate, positive movement. The feminine here is not aligned with a vacuum, and rather than fluid “lacking” fixity, it instead can be said to possess something like flexibility or mutability (indeed it is difficult to find a term to describe fluid properties that does not lapse into the syntax of “lack”, a language of “un”s and “in”s, though arguably this is part of the wider schematic problem…). However, the precise fact that it is difficult to pin down a term to describe fluidity highlights the very point of employing it as a metonymic figure for the feminine – that is, a figure that is in a relation of contiguity; the signifier in metonymy undertakes a sort of re-focussing of attention, rather than a replacement in terms providing an encapsulation of the entire “essence” of the signified. Instead of a metaphor for the feminine whereby the feminine can be defined as being a fluid essence, the metonym implies a relationality as opposed to an identity. Fluid properties can be taken here to emphasise some facet or other of the excluded feminine. Metonymy itself is best exemplified here through Irigaray’s figure of the “two lips”. One lip cannot move without the other; the lips are open and closed at once; they are indistinguishable; both one and two at once. The multiplicity is heightened through the ambiguity of the term lips, which could apply to labia and thus to female sexuality, or to the mouth and to speech; the term applies, again, to both at once. This is a semiotics of non-identity and non-opposition; of irreducible, dissymmetrical difference. The two lips present us with a metonym for the feminine allowing the two to stand alongside one another in the semiotic order rather than a metaphoric displacement, the figure of the lips in itself comprises a metonymic relation of “one” lip to the “whole” of the two lips, as well as of the lips to the feminine body. I think that this subtle semiotic shift is sometimes elided in readings of Irigaray, leading to dismissing her on grounds of essentialism, and I think that this could be detrimental. Another concept from Irigaray that I think receives short shrift in many readings (arguably including Irigaray’s own) is the sensible transcendental. I will try to cover this as succinctly as I can without downplaying its importance to my work. The sensible transcendental represents a move to fold together the sensible and the transcendental in an effort to diffuse the boundary that upholds the binary oppositionality of the two. That which is transcendental is recognised as at once, material – this is a positive, active conception of materiality, rather than inert matter — this links to the reading of the chora and to Butler’s reading of Irigaray, which I can talk about if there are questions, but don’t have time to fully expound here. Anyway. the sensible transcendental seems in Irigaray to represent a sort of porous threshold – links can be made here to her mucous membranes – where there is a collapse of binary oppositional logic. The sensible, by which we tend to refer to discourse and the subjects therein, informs the transcendental, and the transcendental the sensible; there is no fixed relation between the two but a constant and mutual transformability whereby discourse conditions its conditions as it progresses. This is the materialisation of ontology and the ontologisation of materiality; both at once, as Irigaray would have it. 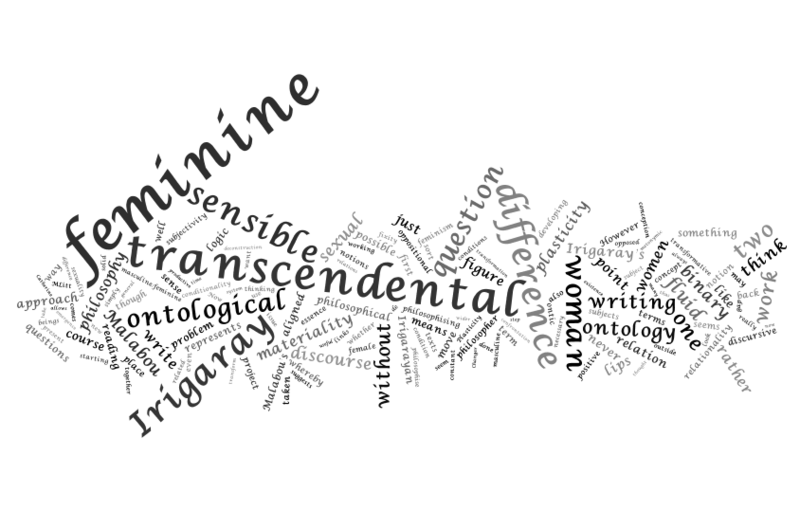 The sensible transcendental, I think, represents a pre-ontological conditionality. It represents the transcendental condition for transcendental conditionality. Materiality is what allows for the evolution of discursive systems, ontology, beings, and all that then ensues. The ontological is itself necessarily conditioned, necessarily contained or constrained; has a necessary “outside” – a chora link again – materiality here is the constitutive outside. If ontology is normally taken as a starting point, the sensible transcendental provides us with the question of what allows for this emergence – not only for conceiving or ordering ontic objects, in which sense ontology becomes a category, but for the very emergence of the ontological question. This also links neatly to the Irigarayan material-maternal – there is no Being without beings; no Dasein without a mother and a material birth, not just a linguistic one. Heidegger does have some recourse to materiality and an attempt to “ground” his ontology, but his materiality is inert and simply cannot account for the emergence of his ontology. The sensible transcendental as an actively transformative construct represents a different approach to conceiving materiality as inherently related to transcendentality. Around about here is where Catherine Malabou comes into my project. In her book, Changer de différence, she explicitly discusses the Irigarayan project, and questions the dynamics at play in Irigaray’s attempts to reposition the displaced feminine. She suggests that Irigaray has a tendency to lapse into a usage of the term “feminine” that goes against her own project’s insistence on fluid and non-oppositional logics. Irigaray speaks of the feminine as the place between binaries – the place between the masculine/feminine divide of sexual difference. As I mentioned earlier, sexual difference is related to Heidegger’s ontological difference, so the feminine/masculine split, as it stands in the tradition, could be read as aligned with the beings/Being split – masculine as ontological; feminine as ontic. But Irigaray wants the “feminine” to be recognised or aligned with the place or relation between these terms – sexual difference is aligned with ontological difference in a more fundamental sense than this brute confrontation, where we come down to the ontological question in itself; ontological difference in itself. Malabou suggests that the Irigarayan project lapses sometimes into an ambiguity – in the pejorative sense – when it comes to sexual difference. What Malabou argues here is twofold. Firstly, she suggests that Irigaray tends too often to reroute the feminine into the same old masculine/feminine binary, whereby it becomes an ontic rather than an ontological question. She talks about Irigaray’s figure of the two lips, suggesting that this comes down to another binary opposition: female sexuality as opposed to masculine sexuality; fluid as opposed to solid; the plural as opposed to the phallic singular. Now, I would want to argue that the way she handles the figure of the lips is too simple, as it is a metonymic rather than a metaphoric figure, and does not “stand for” feminine sexuality in such a representational manner, and this reading is too essentialist. Still, though, from this line of inquiry we can see Malabou’s second critique, which is more problematic, or at least less easily dispelled: Irigaray’s quest for “alternative” imagery, logics and so on runs the serious risk of developing simply a parallel discourse “for women”. Part of this critique does involve the prioritisation of “the feminine” and the problem of the terminology – and of course I can see how it would seem confusing or absurd for me to speak sentences like “ the feminine is intended as the between of the masculine/feminine binary”. Malabou suggests that there is a reduction of “the feminine” to “woman” that Irigaray does not escape, and that, in her own words, “Irigaray’s gesture could seem to cut itself short”. For Malabou, the feminine should merely be taken as one of the metabolic states of the ontic-ontological exchange. Her approach to this persistent problem of oppositionality and symmetry is to displace the ontological question – she says that after Derrida and Levinas, ontological difference has been incontestably pluralised, but that the modality of the relation between Being and beings has never been refigured: a gap is its only mode of existence or conception. This discussion of the “gap” evidently links back to Irigaray’s feminine as “between”. Again, this feminine is related to difference in itself – so we can suggest that on Malabou’s account, this Irigarayan feminine is occupying “the gap” between the ontic and the ontological. However, this is a very spatialised approach to the notion of being “between”, whereas I think Irigaray is looking to the more relational approach to the notion of “between” of mutuality, relationality, negotiation; the real involvement of both sides, and not just the confrontation between them. Nonetheless, the lack of a full conception of the sensible transcendental or its mechanisms beyond the fluid means that Irigaray does seem to be stuck with some sort of a gap here; the sensible and the transcendental may indeed be folded together, but there is no full conception of how. And after all, it is possible to fold things together and to blur them without them actually engaging in any meaningful mutual relation; the fluid filling the cracks of discourse, overflowing them, encircling them, never engaging. This is inadequate for transformation. For Malabou, Being is not thinkable without its ontic transformability, and she plans to use her concept of plasticity, developed after that of Hegel, to break down the post-Heideggerian barrier between Being and being(s). Now, I already discussed how I think Irigaray looks to address this issue by introducing the sensible transcendental, but I move to Malabou’s plasticity for an approach that is more fleshed out, and also avoids the aforementioned problems with regards to lapsing back into oppositional logic. Insofar as the fluid is non-solid, non-capturable, even if Irigaray wishes to imbue it with positive power, this seems like a sort of oppositional empowerment that makes it impossible to transform or even develop any true relationality between the sensible and the transcendental; between Being and beings. Plasticity seems to me to be a useful way to conceive of a between-state of the fluid and the solid; it is, in Irigarayan language, both at once: capable of fixity, but liable to explode at any moment; stable and unstable at once. Plasticity, in this way, always represents a between-state; it is always between one state and another, never solidly fixed, never capturable. This fixity can be conceived as things like a discursive system, or a relatively stable subject, without assigning them a concrete, permanent position; rather they represent points of solidification liable to dissipate; moments where subjectivity can be grasped and where relations can be felt, even if fleetingly, and even if the moment of grasping them causes their transformation and disappearance. This ongoing movement, it seems to me, is a more productive and positive means of approaching the question of discursive systems – a recognition of discursive constitution, in both senses – discourse constituting its subjects, and those subjects constituting discourse: a system in the loosest sense, mutually transformable and not oppositional. Plasticity allows for a simultaneity of fluid and solid, rather than a mere coexistence. As such, it provides us with a mechanism for understanding the relation involved in the ontological-ontic “between”- place taken up by the Irigarayan feminine. Irigaray posits this relationality, but does not furnish us with a fully conceptualised explanation of how this relation works, which is why her work risks the lapse back into binary opposition, or of simply developing a parallel feminine discourse, which of course would not address this ontic-ontological confrontation but would rather reverse the polarity of the binary, to no overall effect. Of course she does not want to do this, but her insistence on privileging fluid logic can lead to an air of it being unquestionably preferable to solid, phallogocentric, oppositional logic, at least “for women”. Even if we are careful readers and lend her work a sympathetic eye for pluralities of meaning and plural voices, then the question of the solid/fluid binary remains unanswered to some extent; there seems to be little or no space for coagulation, or for reciprocal relationality between a sexually differentiated two. Ultimately, this would mean that the ontological question is not addressed. So I think that plasticity can be taken as a means of fortifying or developing the sensible transcendental, a route that Irigaray did not take – she neglects to bring the concept to fruition and it becomes lost in her work despite what I see as productive potential above her other methodologies. I think that thinking through the sensible transcendental and Irigaray’s methods with Malabou’s plasticity lets us really get into the ontological problem, and that plasticity represents a really useful step in the ongoing inquiry. The question, then, that I find myself left with is: what now? What can we do with this? This is an issue, of course, for Irigaray and for Malabou as well; the final chapter of Changer de différence tackles the impossibility of the existence of a “female philosopher”. The relevance of the sensible transcendental, and the opportunity to develop its potential through the conceptual tool of Malabou’s plasticity, is, I think, something we can try to use in developing means of approaching the question of how to philosophise differently. The question of what it is to be a woman, let alone a philosophising one, so-called, cannot be answered without a refiguring of ontology, of transcendentality itself, and of the philosophical terrain: this is a mutual relationality. 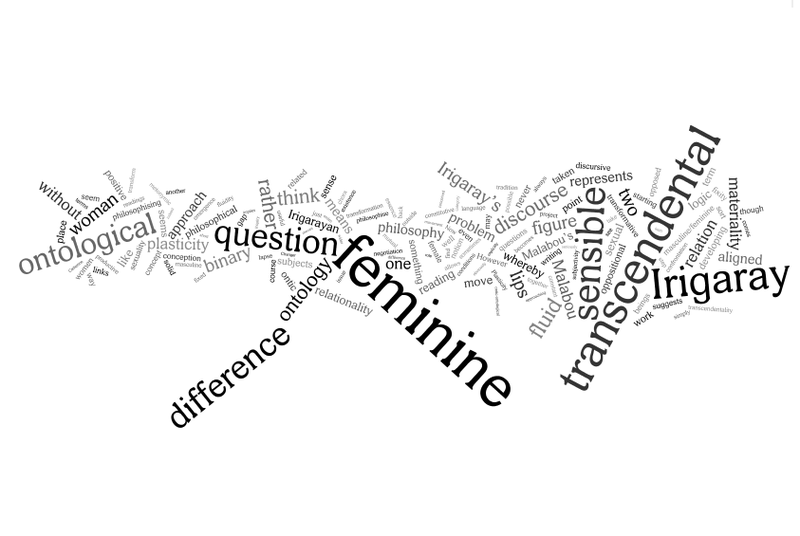 The question and the thought processes that go into answering it are linked, and it is for this reason that Irigaray’s aim of developing parler femme has a productive quality to it; the transformation of the language, of the symbolic order, of ontology, of the sensible, the divine, the transcendental, all feed into reshaping the question and any answer it may have. What it means to be a woman, or to have feminine subjectivity is something in need of constant negotiation – the feedback and changeability inherent in the notion of the sensible transcendental, as conceived here through Malabou’s plasticity, aims for this negotiation. There is no ‘category’ of woman, no essence, no chora to be filled; rather there is a praxis of feminising logic through materiality, plasticity, corporeality, and a striving toward a constant rethinking of ontology and transcendentality, receptive to difference in itself. Any acts of philosophising or philosophical subjectivity – whether feminine or masculine – must then follow in this mode.